However, it was such a glorious day yesterday, that quite a few of my creepy crawly companions were tempted out of their winter hiding places, and were all too happy to come and join my photo shoot. There were lots of different types of bees, bumblebees and flies buzzing around, and I even spotted a couple of red admiral butterflies! My favourite subject of the shoot was this very hairy hoverfly, who was the perfect subject, staying still, enjoying the sunshine, warming up on the leaf of a forest flame bush, while I snapped a few shots! 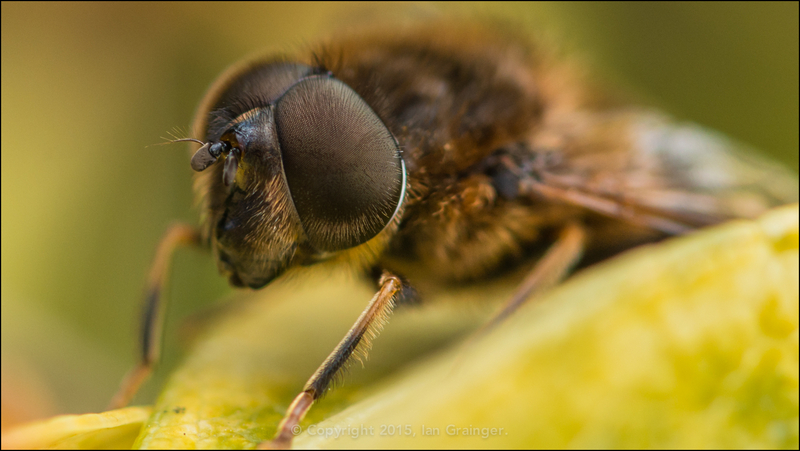 Hopefully, this little hoverfly will be the first of many insect based Image of the Week contributions!